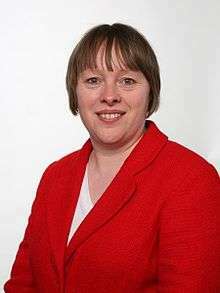 Maria Eagle MP (born 17 February 1961) is a British Labour Party politician who is the Member of Parliament (MP) for Garston and Halewood and former Shadow Secretary of State for Culture, Media and Sport. She has held the rank of Minister of State at the Government Equalities Office and at the Ministry of Justice. She had been a Minister at the Department for Work and Pensions, the Department for Education and Skills, and the Northern Ireland Office. After the 2010 general election she became the Shadow Solicitor General. On 8 October 2010, Eagle was announced as the Shadow Secretary of State for Transport in Ed Miliband's shadow cabinet, and on 7 October 2013, appointed as Shadow Secretary of State for the Environment, Food and Rural Affairs. On 14 September 2015, Eagle was confirmed as the Shadow Defence Secretary in Jeremy Corbyn's first Shadow Cabinet. She was moved to the position of Shadow Culture Secretary in January 2016 and resigned from the Shadow Cabinet on 27 June 2016. Eagle is the twin sister of fellow Labour MP Angela Eagle. Eagle was born in Bridlington, East Riding of Yorkshire, the daughter of Shirley (Kirk), a factory worker, and André Eagle, a print worker. She was educated at St Peter's Church of England School in Formby and Formby High School before attending Pembroke College, Oxford, where she was awarded a Bachelor of Arts degree in Philosophy, Politics and Economics in 1983. She worked in the voluntary sector from 1983 to 1990, and then went to the College of Law, London, where she took her law finals in 1990, before she joined Brian Thompson & Partners in Liverpool as an articled clerk in 1990. In 1992 she became a solicitor with Goldsmith Williams in Liverpool, and later a Solicitor at Stephen Irving & Co also in Liverpool, where she remained until her election to Westminster. After joining the Labour Party, Eagle was elected the secretary of the Crosby Constituency Labour Party (CLP) for two years in 1983, and was also elected as the campaigns organiser with that CLP for three years in 1993. She contested the Crosby seat at the 1992 general election where she lost to the sitting Conservative MP Malcolm Thornton by 14,806 votes. She made her maiden speech on 17 June 1997. In parliament Eagle was a member of the Public Accounts Committee following her initial election, and in 1999 she was appointed the Parliamentary Private Secretary to the Minister of State at the Department of Health, John Hutton. She was promoted to the Tony Blair government following the 2001 general election as a Parliamentary Under-Secretary of State at the Department for Work and Pensions, and after the 2005 general election, she was the Minister for Children at the Department for Education and Skills, until the May 2006 reshuffle moved her to Northern Ireland, where she was Minister for more than one department at a time, including a period at the Department for Employment and Learning, on 29 June 2007 she moved to the Ministry of Justice. As part of the reshuffle of Gordon Brown's government in October 2008, she assumed additional responsibility for the Government Equalities Office. In the June 2009 reshuffle she was promoted to Minister of State within the justice department. Her proposed ban on mink fur farming was defeated as a Private Member's Bill but subsequently picked up by the government and enacted as the Fur Farming (Prohibition) Act 2000. After Labour lost the 2010 general election she served in interim Labour leader Harriet Harman's front bench as Shadow Solicitor General and Shadow Justice Minister. In October 2010 Eagle was elected to the Shadow Cabinet of new Labour Party leader Ed Miliband as Shadow Secretary of State for Transport in the Labour Party Shadow Cabinet election. Eagle was nominated for the Stonewall Politician of the Year Award in 2008 for her work to support equality for lesbian, gay and bisexual people. She was given a score of 93% in favour of lesbian, gay and bisexual equality by Stonewall. On 5 February 2013 Eagle voted in favour in the House of Commons Second Reading vote on marriage equality in Britain. Eagle was appointed Shadow Secretary of State for Defence in September 2015 by the newly elected Labour leader, Jeremy Corbyn. Eagle said she was surprised by her appointment as she disagrees with Corbyn's advocacy of unilateral nuclear disarmament and supports of the renewal of the Trident nuclear weapons system. Tasked with leading Labour's defence review, she said that she would not rule out the possibility that it might recommend unilateral disarmament, but described Corbyn's comments that he would not countenance using a nuclear deterrent as "unhelpful" to the policy process. In January 2016, she was moved to the position of Shadow Culture Secretary. She resigned from the shadow cabinet on 27 June 2016 in the mass resignation of the Shadow Cabinet following the Brexit referendum. On 17 May 2009 The Daily Telegraph revealed that Eagle had claimed £3,500 for the refurbishment of the bathroom of her Liverpool home property, then switched her second home designation to a different property four months later. Eagle voted in favour of legislation which would have kept MPs' expenses information secret. Maria describes herself as "I'm the straight one". Her sister Angela is gay. ↑ They are sometimes incorrectly described as the first set of twins to sit in the Commons at the same time; in fact the first set of twins is believed to have been James and Richard Grenville, who sat together for Buckingham between 1774 and 1780. ↑ "Jeremy Corbyn announces new Shadow Cabinet appointments". Labour Press. Retrieved 27 May 2016. ↑ "The Biography of Angela Eagle". Angela Eagle. 2008. Retrieved 17 October 2010. ↑ McDougall, L.; McDougall, Linda (31 January 2012). "Westminster Women". Random House – via Google Books. 1 2 Dod's Parliamentary Companion. Vacher Dod Publishing. 2005. p. 153. ↑ "UK General election results April 9th 1992 [Archive]". www.politicsresources.net. Retrieved 27 May 2016. ↑ Rentoul, John; Ward, Stephen; MacIntyre, Donald (9 January 1996). "Labour blow as all-women lists outlawed". The Independent. London. 1 2 3 Eaton, George (14 October 2015). "Maria Eagle on nuclear disarmament: "I'm not ruling it out"". New Statesman. Retrieved 9 November 2015. ↑ Farrell, Stephen. "Twins in Parliament: the Grenvilles and Buckingham Borough, 1774". The History of Parliament Online. Retrieved 10 July 2016. ↑ "Maria Eagle: Political Profile". BBC. 21 October 2002. Retrieved 9 November 2015. ↑ Shaw, Milly (23 September 2008). "Stonewall Awards shortlist announced". Lesbilicious. Retrieved 27 February 2013. ↑ "Stonewall MP Voting Records 2010 (Voting on key gay equality issues in Parliament, 2005 to date" (PDF). p. 6. Retrieved 27 February 2013. ↑ "House of Commons Hansard Debates for 05 Feb 2013 (pt 0004)". 5 Feb 2013 : Column 231. Retrieved 27 February 2013. ↑ "Jeremy Corbyn shadow Cabinet live: Labour leader under fire after ignoring women for top jobs". 14 Sept. Retrieved 14 September 2015. ↑ Dathan, Matt (30 September 2015). "Jeremy Corbyn's ability to become Prime Minister questioned by shadow defence secretary". Independent. Retrieved 9 November 2015. ↑ Mason, Rowena; Perraudin, Frances (6 January 2016). "Labour reshuffle: Thornberry replaces Eagle for defence, McFadden sacked and Benn stays". The Guardian. Retrieved 27 June 2016. ↑ Syal, Rajeev; Perraudin, Frances (27 June 2016). "Shadow cabinet resignations: who has gone and who is staying". The Guardian. Retrieved 27 June 2016. ↑ Sawer, Patrick (17 May 2009). "Maria Eagle: bathroom renovated on expenses before flat was 'flipped'". Daily Telegraph. London. Retrieved 12 May 2010. ↑ "Interview: Maria Eagle defends homophobic incitement law".